We all – well, most of us anyway – want to be liked. We know, deep inside, that being likeable actually helps us to get ahead in life – winning that sales pitch, landing that coveted job, or being the choice of a customer. The problem is that it’s difficult to pin down exactly what it means to be liked and how we can get there. 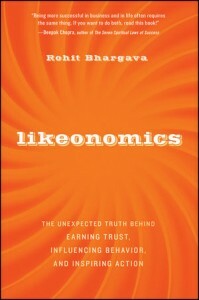 Well, marketing expert Rohit Bhargava’s new book, “Likeonomics: The Unexpected Truth Behind Earning Trust, Influencing Behavior, and Inspiring Action“, looks at the subject of likeability and argues that this quality has become the currency of a new era. If his name sounds familiar, you may have read his previous book “Personality Not Included : Why Companies Lose Their Authenticity And How Great Brands Get it Back” where he argued that brands needed to inject personality into the souls of their business and products. He continues that line of thinking with Likeonomics. Thankfully, the book has nothing to do with getting people to click on Facebook’s ‘Like’ button (although that result can be achieved if you’re inherently likeable). Instead, it’s really a glimpse into behavioral economics, sociology and human nature. In the book Bhargava explains the ‘Likeability Gap’, which describes the difference between what someone decides to do something because they have to, as opposed to what they do because they want to. And when more people do things for you because they like you, that’s where you’ll reap the most benefit. Bhargava asserts that the most important factor in people’s decision making is truth and integrity. The more they trust you, the more they respond to you. Being likeable because you’re truthful in your ways builds relationships. Relevance happens when you “combine a meaningful point of view and having something to say with the right context for it to really matter”. The problem is that relevance is always changing, so the challenge is getting people to do something and act quickly when they’re inspired. People tend to like people who are, well, simply nice. If they know you operate on a level that is unselfish and not self-seeking, they will reward you with their loyalty. In a world overrun by complexity, simplicity has its charms. And the simplest things often come as a result of reduction, where you take away the things that don’t really matter and distil the essence of what you do. Even the best ideas can fall prey to bad timing. Unlike many other books of the same vein, Likeonomics isn’t chockful of serious case studies to support his views. Instead, he peppers the book liberally with stories that entertain yet make you nod in agreement at the same time. You’ll read about likeable leaders such as Nelson Mandela and Oprah Winfrey who gets ahead because they’re such likeable characters, but also leaders such as Steve Jobs and Larry Ellison who scored even though seem unlikeable. He explains how Rockefeller transformed into an image that is synonymous with philanthropy, or how Costco insists on passing most of its savings to its customers. But can reading a book help one become likeable? That’s debatable. If you’re a brand marketer, I’d argue that you’d be able to pick up some tips from Likeonomics that can help transform your brand (assuming you can convince management). But the book really comes into its own if you’re a small business owner who can really take these lessons to heart and transform your business from the inside out.